Charlotte's trees reduce heat from urban and developed areas. Due to the urban heat island effect, built-up urban areas without trees often experience temperatures 15-25°F hotter than nearby, less developed areas. Heat stress has been proven to cause significant public health problems and even mortality. In fact, each year more Americans die from extreme heat than all other natural disasters combined (i.e., hurricanes, floods, tornadoes, lightning). Those over 65 or under age 5 are especially vulnerable to heat-related health problems. These two age groups account for almost one-sixth of Charlotte residents (15%). 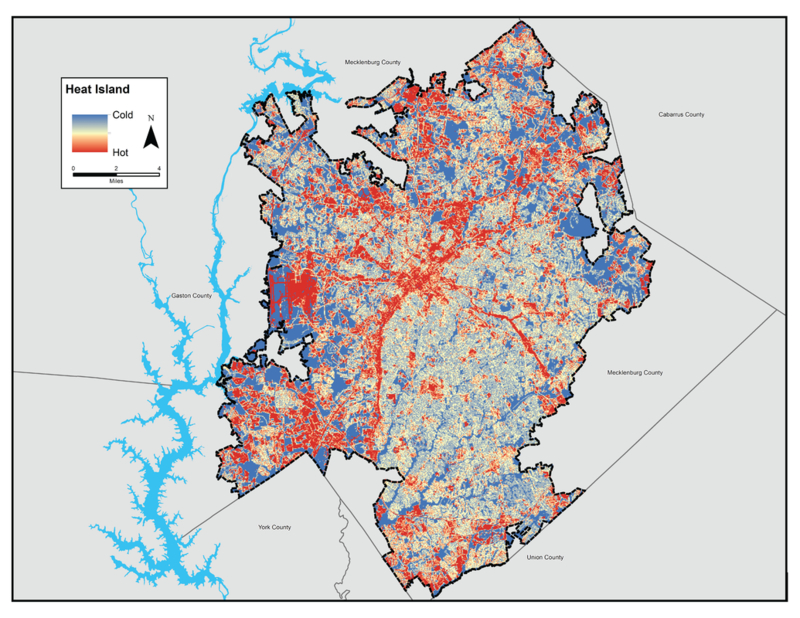 The hottest areas in Charlotte are found along major arterial routes throughout the city, as shown in Figure 2. Urban trees are widely accepted as one of the most effective long-term solutions to reducing the effects of urban heat islands. Tree canopy can lower ambient temperatures by 20°F to 45°F (EPA 2015). "We need all the trees we can get. I'm especially liking the medians the city is putting in roads with trees planted within. It really cools the pavement. I wish we could do this everywhere...Let the trees grow to within six or eight feet from the sides of roads so they'll hopefully form a canopy over the streets, further cooling the pavement." ​"Temperatures and pollution is getting much worse in Charlotte. Trees are really the best defense. Parking lots and barren land are like heat banks...We need more trees!" 42% of survey respondents ranked shade and cooling in their 'top 3' most important benefits provided by trees.